Chalet Bobb forms part of Four Twenty L’Élé, a masterpiece in architecture and design having been transformed in 2016 from a traditional barn into a stunning, modern chalet. Floor to ceiling windows, industrial influenced features and traditional wooden beams coupled with designer fixtures and furnishings make this property a calm, chic and minimal place to enjoy your winter or summer holiday from. The entrance level of the chalet is a large open plan living, dining and kitchen area that is flooded with light and sunshine through the massive glass fronted wall that looks out to the garden and Parc des Dérêches. The glass doors open onto a balcony that enjoys the sunshine throughout the day and into the evening. Also taking in this view is the sitting area that surrounds a wood burning stove and a large dining table complete with Vitra rocking dining chairs. A piano in the living area adds to the elements of fun that have been incorporated in to the design of Chalet Bobb, whilst the iMac, iPad, GoPro© and printer mean that you have everything you need for business requirements and to stay in touch whilst on holiday. The kitchen is open to the living area making it a sociable environment and it is well equipped with everything you need for self-catered holidays. A laundry room is situated behind the kitchen with a separate washer and dryer. Central to the living area is a stunning glass staircase that leads to the upper bedroom level. 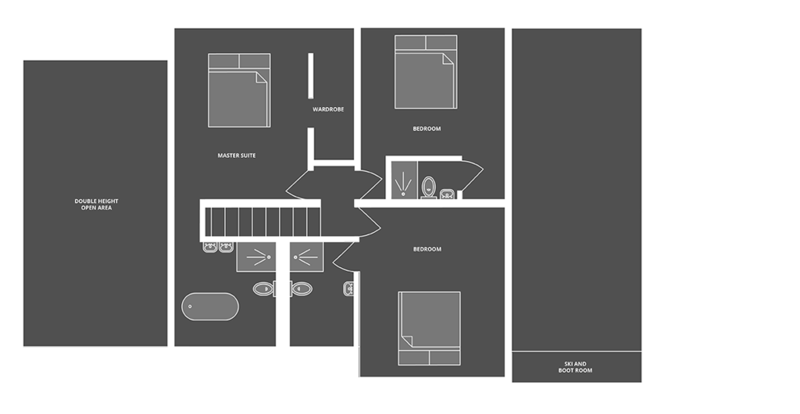 Two bedrooms and a master suite are located on the top floor and all are en-suite. The master suite has a super king sized bed and looks out over the living area, taking advantage of the glass fronted wall and valley views. The bathroom has a beautiful free standing bath from which these views can also be enjoyed. The original exposed beams, which are integral to the design of Chalet Bobb, are a stunning feature within this open bedroom. 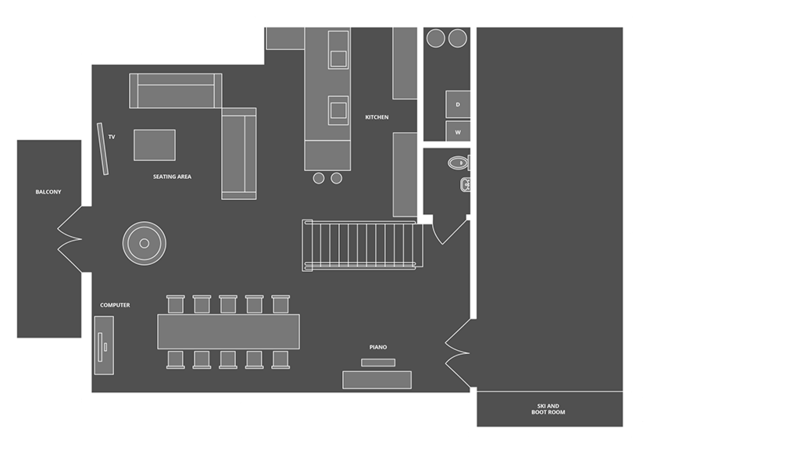 The further two bedrooms can be configured as either twin or king. There is adequate parking for 2 cars and storage for skis and boots at the entrance of the chalet. Heated boot warmers will dry out and warm your boots ready for the next day. In summer there is access to a lockable store which is suitable for bikes. A sheltered outdoor area provides ample space for working on bikes, skis and boards if required. ** Available at extra cost – private chef, host, resort driver service, delivered catering, full grocery shopping, newspapers, morning bakery delivery, wine supply and delivery, mid-week changeover, laundry service, extra cleaning services, lift passes, airport transfers, in-chalet equipment fitting & hire, ski tuition and guiding, day excursions. Chalet Bobb is located a few minutes drive from Morzine centre and is also just a few minutes from the beautiful village of Montriond. If you choose to opt into our resort driver service, you will be able to call for a lift to and from the ski lifts or village centre throughout your stay. In winter the free bus service stops a few minutes from the chalet garden providing access to all ski lifts. Walking to and from Morzine centre takes approximately fifteen minutes, crossing the suspension bridge and walking along the valley. Chalet Lorne is a beautiful new five bedroom chalet that offers the perfect modern self-catered property from which to enjoy your mountain holiday. With an outdoor hot tub overlooking the Parc des Dereches, a cinema room and spacious open plan living areas, Chalet Lorne caters to families and friends looking for a relaxed luxury holiday. Lodge Des Nants is a spectacular new chalet and one which encapsulates the essence of luxury ski holidays.For those looking to truly indulge and holiday in unsurpassable accommodation, Lodge Des Nants is the ultimate luxury chalet. Complete with an indoor swimming pool, hammam, spa treatment room, sauna, cinema room and stunning roof top hot tub and deck overlooking Morzine and Avoriaz, it is the perfect chalet for a truly lavish escape. Designed and newly built as a luxury family property, Chalet Aubois truly feels like home from home and a place you can really relax in. Situated at the beginning of the Vallée de la Manche, it commands the most spectacular views of the Pleney and Nyon pistes and is nestled in to the hillside overlooking the Morzine valley. Apartment 6˚ has been beautifully renovated in 2016 into a modern, luxurious three bedroom apartment. The spacious apartment is set on one level and is ideal for self catering. Floor to ceiling windows, industrial influenced features and traditional wooden beams coupled with designer fixtures and furnishings make this property a calm, clean and minimal place to enjoy your winter or summer holiday. A large open plan living area with a wood burning stove is central to the apartment and has direct access to a private balcony via glass sliding doors. The kitchen and dining area are open to the lounge making it a sociable and modern space to relax in. Situated in one of the sunniest locations in Morzine, The Bungo is the perfect choice for both winter and summer holidays in Morzine.